The Friedman Memorial Airport Authority announced during an emergency meeting Wednesday evening that it will file a lawsuit against the Federal Aviation Administration seeking an injunction to keep the air traffic control tower open. The tower is one of 149 across the nation slated for closure as the result of the federal sequester. The meeting was held on short notice under the “emergency” provision of the Idaho Open Meeting Law, which allows political entities to hold meetings with less than 24-hour notice if the situation deals with immediate financial loss or other extreme circumstances. This is the second emergency special meeting of the Airport Authority within a week. The topic of litigation was broached at the authority’s last meeting on March 21, when members decided to wait on litigation until the FAA had decided whether to cut funding for the tower. The next day, the FAA alerted airport Manager Rick Baird that the tower had been slated for elimination of funding on May 5. 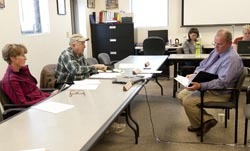 Of the Airport Authority’s board members, only Hailey representatives Don Keirn and Susan McBryant attended Wednesday’s meeting in person, while County Commissioners Larry Schoen and Jacob Greenberg, Hailey representative Fritz Haemmerle and Chair Ron Fairfax participated by phone. The decision was made after an executive session to discuss the litigation, which took up most of the meeting. However, Baird gave an update before the executive session began stating that he believed closure of the tower would create more delays and possible flight cancellations. Baird said a representative from Horizon Air told him the airline could continue to fly into Friedman, but that service might be compromised by the lack of a tower. The cancellations, he said, would be due to the airline’s inability to schedule flights around lengthy delays that would be caused by the lack of a tower at Friedman. Baird also said he has not received a response from the FAA regarding whether Horizon’s Q400 aircraft would even be permitted to operate. The aircraft is only allowed to arrive and depart through a letter of agreement with the tower, and Baird said the status of that agreement is uncertain if the tower closes. The status of the Embraer 120 and the CRJ 700, both of which are used by SkyWest Airlines, would also be in question. Fairfax said he believes a tower is vital to airport operations. Greenberg said the estimated cost of litigation is $16,000 to $30,000. The cost of funding the tower would be about $45,000 per month. Closing the tower would also require Baird to complete a five-page list of procedures related to the tower closure before May 5, a task that he estimated would take him six months, not a little over 30 days, to complete under ordinary circumstances.